​1) Negotiation Skills - I will help you negotiate the best price and terms on your purchase taking into consideration your required time frames, your budget, your other needs, your tolerance for risk, current market conditions, etc. 2) Strategic - My years of experience (since 2003) as both a buyer’s agent and listing agent helps me understand thought process on both sides of the transaction and this will help you develop the best offer strategy for the property you’re interested in and maximize your chances for offer acceptance. Offer price is not the only way to make your offer appealing to sellers, there are many other offer terms that can help you win offer acceptance over other buyers. 3) Network - My network of vendors (escrow companies, inspectors, etc.) that I've developed over the years will be available to you should you choose to use them. 4) Professionalism - My ethics, communication skills, accessibility and responsiveness shall help make your home buying experience a positive one. 5) Patience - The real estate process can sometimes change a buyer's goals and because I realize this I don't pressure my clients to buy a home immediately, nor do I pressure my buyers to buy a home they are not comfortable with. I work with my buyers for as long as it takes to buy a home that makes them happy. For a short video and more information about me, click here. 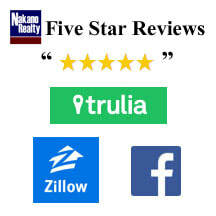 ​Visit links for five star reviews on Zillow, Trulia and Facebook. "Kevin NAKANO was amazing. I was new to the whole process and Kevin was so patient and detailed in everything. He was there working for and with me seven days a week. He made everything easy, smooth and fun. He also was extremely thorough. He seriously is the best realtor and I’m so glad I listened to my friend who referred me to him." "We were very happy with Kevin as our realtor. He was very knowledgeable and patient. He had our best interests in mind and helped us negotiate a quick deal on our dream home, even though it was listed as a short sale. We won’t use anyone else in the future." "Kevin was very attentive to my needs as a first time home buyer. He made sure all my questions were answered and explained each step of the buying process in simple terms. I would recommend Nakano Realty to any prospective home buyer." "Kevin Nakano just helped me purchase a home in the Natomas Park area and it was please working with him. Kevin championed the deal a way that I felt completely informed and secured with all my decisions. I never felt pushed nor pressure on any decision. Kevin was very open and honest with all my questions, and I felt very secure in asking any questions to him. This was my third time working with Kevin on a real estate deal and I surely will work with him again. I recommend Kevin Nakano as Real Estate Broker for his honesty, integrity, and knowledge." "Kevin helped my wife & I buy our first house back on 2009 even though we were really young. We had bad experiences with other realtors that didn’t took us seriously because of our age, but Kevin took really good care of us by going beyond our expectations. He did such a good job by explaining us everything there is to know about real state. We were so please with his work that we came back to him when we bought our second home last year. We really recommend his experience and knowledge to everyone in the area. Thank you Kevin." "I am a first time home buyer and didn’t understand much about the process. Kevin took the time to explain each step. I purchased a great home in my price range that he suggested based on my specifications. He made my buying experience very pleasant. I recommend his company for any of your real estate needs." "As first time home buyers, we had no idea of what we were getting ourselves into. Luckily, we were referred to Kevin and the rest was a breeze. Kevin is the smart kid in class with all the answers, the crosswalk guard to guide you safely to your next step, and the detail oriented scientist who examines the smallest of details. Amongst the many hats that Kevin wears, he also carries a deep bag of amazing referrals. At each “intersection” in the process that we came to, Kevin met us there with two to three referrals and presented the advantages/disadvantages of each. We couldn’t have asked for a better agent who looked out for our best interest and ensured that we fully understood the impacts of each of our decisions. Please do yourself a favor and work with this prime example of what a real estate agent should be."